Happy Sunday! 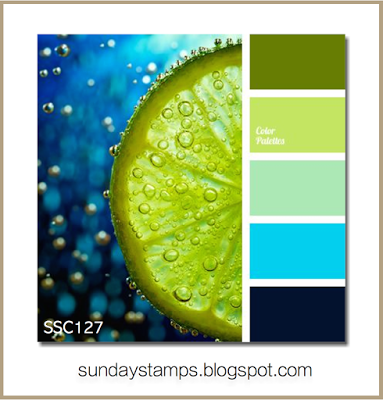 I've missed the last 2 Sunday Stamps challenges due to a busy schedule but I'm back and wow, I love the colors we have this week, they are totally up my alley! My nephew graduated from high school on May 9th and one of my friends sent him a lovely card and gift so he needed a thank you card to send to her. She's got a fun and vibrant personality so I thought these colors would be perfect for her card! I used MFT's Blueprints 27 to cut out my scalloped frame and the stitched window panel. The birds are from the MFT set Tweet Friends and I colored them in with the colors from the challenge (I chose to use the shades of green along with the turquoise). I used dimensionals to pop them up along the frame. 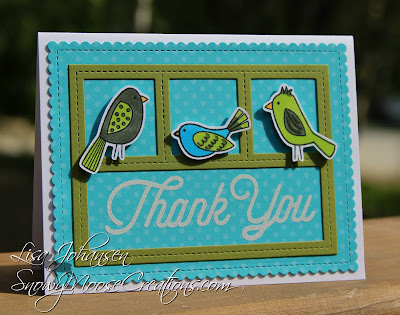 The sentiment is from MFT's Kind Thanks and I heat embossed it with white embossing powder. In person it really pops and looks great against the green and turquoise colors! Head on over to the Sunday Stamps blog to see what the rest of the DT came up with and then play along with us! This is super pretty, love your design! Such a cute birdie card! Love your frame and the colors you chose. A Very cute card girlfriend! Stunning card, I really like how the window frames showcase the birds. Lovely colors.